Hello, my name is Alan Yeoh. I am a games artist working in mobile games industry. I started my career a few years back then with Codemasters studios, producing arts for racing games such as dirt series and f1 series, I also worked on few shooters such as bodycount and operation flashpoint: dragon rising. I now work as senior games artist at King, creating games art through concepts and 3D. I work as part time sound designer as well. I’m a curious on a lot of stuffs. The environment for ‘Adventure Academy’ is based on the concept art by illustrator, Denis Spichkin. The idea stems from a game concept that my friends and I used to work on, where aspiring explorers attend an institution called Adventure Academy. Kiko-chan is one of many budding adventurers, with a keen enthusiasm for exploring the outdoors with her crew of trusty gadgets. The concept art created by Denis managed to capture my attention as it closely resembles the images that we had in mind when we were developing our ideas, so I decided to make it into 3D game world. 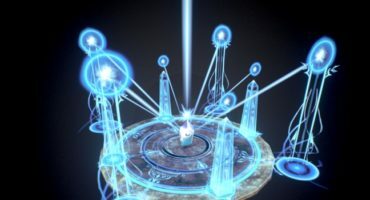 According to the concept art, it seems to be a grid-based game; or at least that is how the game level is built – grid-based with modular assets. Everything in grid-based games are always aligned and straight, and the scales are usually non-realistic. I used this as a guideline to create the scene. Breaking the scene into 4×4 tiles, I created all props within the size of a tile as a simple rule. I tried to use as much polygons as possible on curves and corners, while reducing polygons on flat surfaces drastically. Kiko-chan, the flags, satellite dish and tent all have organic and curvy shapes, and are easily the focus points of the scene, so they have more defined shapes compared to the rest of the scene. I’ve always loved hand-painted textures so I decided to hand-paint the whole scene, including the lighting and shading as well. I only baked simple occlusion for the floor mesh, to simulate the radiosity and create a more clay-like, matte texture. Creating the character was the fun bit to work on. Kiko-chan was designed by my friend, Karana, one of the minds behind the idea of Adventure Academy. The character concept was drawn in 1:3 ratio, but I decided to change it to 1:2.5 ratio to fit the style better. I combined the props that Kiko-chan was carrying with her into a single texture sheet, so the whole scene uses only 2 textures. The occlusion maps are also duplicated and uses an ‘overlay’ filter to create a nice color temperature gradient, which is my personal favorite technique when creating vibrant textures. I used a simple bone rig and posed Kiko-chan in 3ds Max, converted it into mesh and polished it by adjusting it vertex by vertex. Finally, I imported the scene into Sketchfab, and used only one directional light to cast runtime shadow. Then I dimmed the ambient light to compensate for the light coming from directional light, so that it stays close to the concepts created. The whole project took 6 days to complete. 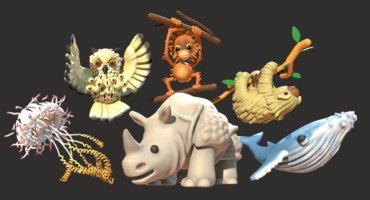 Thanks Sketchfab for providing such a great way to preview 3D artworks! You can see more of Alan’s work here on Sketchfab and on his Behance portfolio.